Fake and misleading AI news is everywhere today. Not just “instantly,” notice, but “INSTANTLY!” The Daily Mail is the United Kingdom’s second biggest-selling daily newspaper. The web article, as is typical for commercial media websites, is surrounded by ads. When I visited, one was for the latest movie in the Avenger series. Another is for auto insurance. There are links to other news stories on the site plus some sponsored clickbait links with teasers like “The Most Beautiful 1969 Photos” and “Why Women Cheat.” But hey. This is how websites make money. And in the same way, attention-grabbing headlines about mind reading AI are clickbait for unsuspecting web surfers. These first two bullets are scary stuff. Better go wrap your head in tinfoil so the NSA can’t read your most secret thoughts. As with all hype, there is some truth in the piece. A headline like “New AI outperforms humans by a factor of a BILLION!” could be written about a calculator that computes specific values of trig functions. Calculating the cosine of 27.3 degrees from scratch to six significant places is a laborious time sink for a human being. Most cheap calculators can do it in the blink of an eye. The Daily Mail article is misleading in a similar way. We are led to believe that the AI application can do something much more unexpected and significant than it actually can. · Two people were used in the mind reading experiment. Both were being treated for epilepsy. 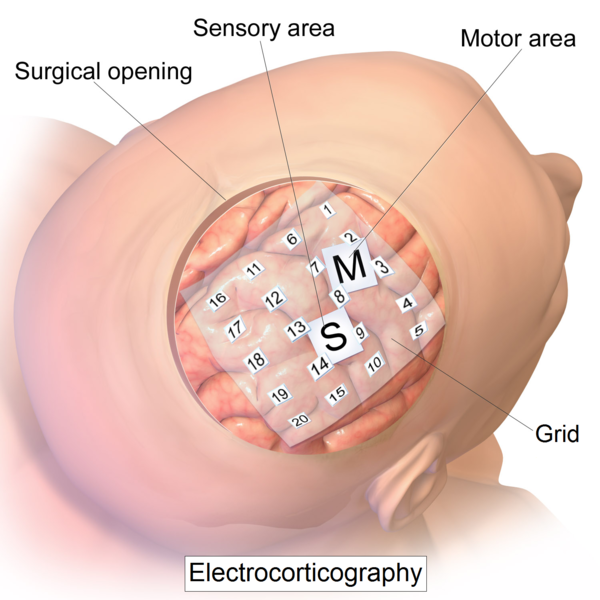 For the treatment of their seizures, the subjects already had 128-channel ECoG (Electrocorticography) units “surgically implanted on the cortical surface” of the brain. Doing so requires a craniotomy where the surgeon saws out a section of the skull large enough to allow the unit to be placed directly on the brain. · One of the biggest obstacles to mind reading from brain signals is noise. Conventional electroencephalography (EEG) electrodes monitor brain activity from outside the skull. Reading signals directly on the brain surface rather than through the skull reduces noise significantly. · The mind reading results are subject dependent. A mind reading system trained on Donald Trump would not necessarily work on Nancy Pelosi and vice versa. Data is collected from a single person and then machine intelligence trains for reading of the mind for that person only. When enough brain signals are read, a machine is trained using the example signals. There is a lot of processing performed on the brain signal before it sees an A.I. classifier. This man-in-the loop preprocessing is typical. No AlphaGo, IBM Watson, or convolutional neural networks are used. Training of the A.I. uses methods dating to the 20th century. This is not bad. The choice of machine intelligence algorithms should fit the problem and many of these older techniques often work effectively. There is no reason to kill a fly with a sledge hammer. The brain signal processing allowed detection of 37 phonemic types. · The results are interesting and significant but are far from the Daily Mail claim the machine can “translate any thought.” Thoughts can consist of images, nonverbal hunches and emotional responses. There is no work on these and other types of thought. Yet. This research may one day lead to AI that can read minds. Or maybe it won’t. Establishing intermediate results are what incremental research is all about. The research results of Moses, Leonard, and Chang are important. The hype from Hussain for the Daily Mail cheapens it. So here is one rule for easier hype detection: When in doubt, go back to the original source. That may be a bit harder to read but it won’t be tinfoil hat-friendly. Note: The image shows a 16 channel Electrocorticography unit. Unlike the one pictured here, the mind reading EcOG was placed on the cortical surface according to the authors. Blausen.com staff (2014). “Medical gallery of Blausen Medical 2014”. WikiJournal of Medicine 1 (2). DOI:10.15347/wjm/2014.010. ISSN 2002-4436. – Own work, CC BY 3.0. Better medicine through machine learning?